I hear a lot of talk about, "local." What does local mean? I'm confused. Is it grow local? Manufacture local? Eat local? Shop local? Hire, or work local? Local to what? Isn't it relative? I posed the question to a group of people who are trying to eat local. I also spoke with some of our town's Chefs who are searching hard for fresh, local ingredients. Truth is, it's kinda murky. Seems like local is closer if you're in the city. Here's the irony for those in rural areas. Major metropolitan areas are ringed by networks of organic, chemical-free farms, lots of manufacturers using local raw materials, and lots of small (and large chain) stores selling 'local' products. Here in Southern Delaware, 2 hours from the closest major metropolitan area, there are very few options for sources of local growers producing a diverse crop. Trust me, I'm a local grower and retailer. I have a hard time finding local, organic or chemical-free anything. Now I love a good olive oil, and adore agave nectar, and decent cheeses. The last time I checked, there are no olive groves, agave fields, or cheese producers around me. So, here's my 'local' definition (as a consumer, not just a food market owner). If you're in a major metropolitan area, local can be as little as 20 miles. If, like us, you're away from a metropolis, local has to expand to include neighboring states and becomes as far as 200 miles. For some ingredients, local is not an option. Better something than nothing. Seek out local businesses, support and encourage them. Help them get better at helping us all in our local communities. Keep your hard earned income in your community. Else, be one of those people at the dinner table, saying, "I loved (insert local business name here). What happened to them? Why do I have to drive out of state to get...?" Intimidated by trying the same thing The Firehouse Gallery folks did? There are still things you can do to support local. Even if it's a small vegetable garden out back. 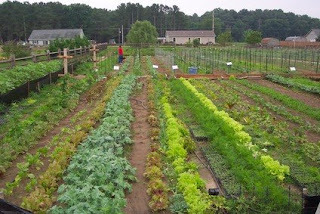 Ask a local business if you can use part of their lot for a community vegetable garden. Seek out your local produce market, or garden center. Request that they offer classes on vegetable gardening, or cooking. Any good produce manager, nursery manager, bakery manager, or grocery store manager, should also know how to grow it or cook it. You wouldn't trust a local garage to change your oil unless they knew something about cars, now would you? Thoughts, or experiences on local? Post a comment. Until next time. Whoop-de-doo. Andy for G4U Market, Lewes, DE. Hi Andy. I am starting small - a raised bed vegetable garden in my backyard. Any suggestion on what will grow well in our area and going organic? Hi ScubaLAS. Thanks for the great question. We are in zone 7 with sandy soil in DE, which is reasonably predictable at the G4U Farm, which has not seen chemicals or construction. I also do an annual soil test. The trouble in our back yards, with so much new construction and fill dirt, it's a gamble for what type of soil we get. I'm going to be running a series of blog entries in a few weeks on building and growing a raised bed vegetable garden in preparation for spring. Also the blog series will be taught at the G4U store as an instructional workshop. In conjunction with the workshop, we will be constructing and planting a raised veggie bed at our G4U garden at the store. Stay tuned for blog updates and a calendar of events in our weekly newsletter. Good For You for growing a raised bed! It’s a great stress release and the taste of fresh picked, organic veggies can’t be beat. Try English peas, a looseleaf lettuce mix, and Swiss Chard for early spring planting. Once tasted, you’ll be hooked!